Your help is urgently needed to help us locate one of our educational birds that was stolen from the CPF Raptor Centre sometime after 11:00 pm on the evening of Saturday the 23rd of July (and before the following Sunday afternoon). On Sunday afternoon Tracy Simpson alerted us that upon her arrival to the CPF Raptor Centre in the Kortright Conservation Centre, she found that the lock to one of the walkways and the lock to Tarah's pen had been cut. Tarah had been removed from her pen. 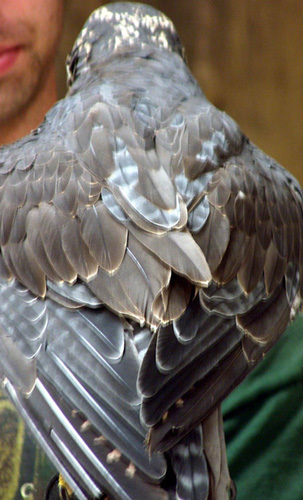 Tarah is a large female juvenile Peale's peregrine falcon. She has dark streaking on her chest and has mostly brown feathers. She is currently going through her first moult and has a mottled appearance, with new adult feathers being dark blue in colour. Her feet are yellow and her cere and skin around her eyes is turning yellow. Please see the pictures above for what she looks like. On Saturday evening itself she weighed 2 pounds, 4 3/4 ounces. Although her weight is subject to change, especially as time goes on, her appearance will change much more slowly. There will be more blue feathers, less brown feathers, and a greater amount of yellow in her cere. Tarah was wearing a seamless band with the following number on it: GCBF-ON-04/55. 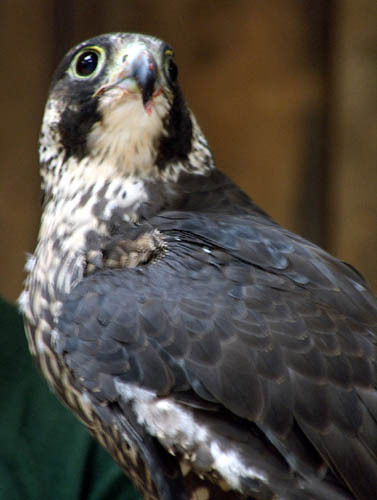 If you are approached by anyone offering the sale of a peregrine falcon please take the possibility that it might be Tarah into consideration. More than likely her band will be cut off, but another band could be put on her. This band will not be seamless. The CPF is offering a reward for the successful apprehension and conviction of whoever has done this, and/or the return of Tarah to the CPF. Those of us at the CPF have grown incredibly fond of Tarah and we would dearly like to have her back safe and sound. If you have any information at all, please call the CPF at 416-481-1233 (or 1-888-709-3944), York regional police (1-866-876-5423) and Crimestoppers (416-222-8477 (TIPS)). Alternatively, visit www.222tips.com and submit tips online.